Another great day!!! Nicole, from Tribute Books, will be introducing us to an amazing woman today as she stops by, visits and talks about her novel. Please, help me give a very warm welcome to this incredible author, Ms. Lynda Fishman!! In 1970, when she was thirteen years old, Lynda’s life came to a disastrous halt when her mother and two younger sisters were killed in an Air Canada plane crash. As a young teen, Lynda made a conscious decision to become happy and to lead a fulfilled life. Lynda chose to live. She was committed to learning, growing and making a difference. Determined to find meaning and purpose in her life, she managed to muster up the courage and strength to dream big, to be idealistic, to strive for more, and to live a meaningful life where she could make a difference in the lives of others. Lynda Fishman is a trained clinical social worker who has spent over twenty years as a camp director. In the early 90s, Lynda was one of the first camp directors in the Toronto area to incorporate children with special needs into mainstream camp life. Lynda has devoted a lifetime to organized camping and is passionate about the positive role of camping in a person’s life. She is the owner and director of Adventure Valley Day Camp. Lynda is a motivational and inspirational speaker and facilitator. She has published articles and training manuals on leadership, teamwork, bullying, trust, childhood health and wellness, communication and customer service. Lynda’s husband, Barry Fishman, has his own amazing story to share, having been orphaned at age 17 and left alone to care for his brother with special needs. Lynda and Barry met as teenagers and have been together since then. They have three grown children, and the whole family is heavily involved in supporting children dealing with tragedy, cancer or other life-threatening diseases, fund-raising and charity events. Barry has spent his entire career working in the health care and pharmaceutical industry. He is President and CEO of the Canadian operations for the world’s largest generic pharmaceutical company, Teva Pharmaceuticals. Barry serves on the Board of Directors of the Childhood Cancer Foundation. Lynda is a woman of action. She has incredible enthusiasm for life. She is persistent, focused and faithful to her dreams and goals. She is willing to work for everything with patience, optimism and determination. She finds ways to be grateful and positive. Lynda goes out there and does what she has to do with a CAN DO attitude of gratitude, positivity, compassion, and honesty. At thirteen years old, Lynda’s life comes to a disastrous halt when her mother and two younger sisters are killed in a plane crash. Her father, overcome by despair, simply continues to exist, in a state devoid of hope. After burying a wife and two young children at the age of 44, the overwhelming responsibility of raising a daughter alone completely immobilizes him. In Repairing Rainbows she candidly describes the agonizing memories, deafening silence and endless hardships that are the fallout of incredible loss. As we follow her through marriage, motherhood and her own spiritual journey, Lynda reveals her complex feelings of hope, anger, pity and determination. Most importantly, she learns the crucial difference between “truly living” and the existence that is so often mistaken for being alive. 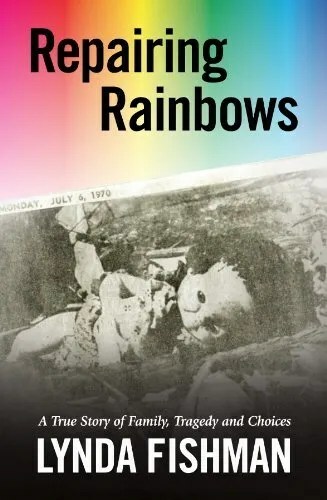 A true story, written by a woman whose normal and abundant life hides a terrible past, Repairing Rainbows is loaded with important lessons to help others overcome struggles and obstacles, and fulfill their lives. It is a powerful, captivating, riveting and easy-to-read story that will undoubtedly touch the hearts of its readers. Guest Author Lynda Fishman The story continues……….